This CellML model runs in both COR and OpenCell to recreate figure 4 from the original paper. All parameter values are set to the same as those in table 1, with the exception of P=0.052 and Q=0.042. There is a small step increase in ACTH concentration from 12pM to 16pM for a duration of 10 minutes with 15 minutes between the two pulses. The units have been checked and they are consistent. ABSTRACT: Adrenal secretory rates of cortisol and arterial concentrations of adrenocorticotropin (ACTH) were measured in conscious trained dogs subjected to intravenous infusion of ACTH. To investigate the causal relation of ACTH to the secretion of cortisol, a mechanistic mathematical model based on current hypotheses of adrenocortical function was constructed and tested. It is widely believed that ACTH stimulates cortisol secretion through adenosine 3',5'-cyclic monophosphate (cAMP), which provides substrate cholesterol by activating cholesterol ester hydrolase and facilitating transport of cholesterol to the side-chain cleavage enzyme. In addition, cholesterol modulates its own synthesis by inhibiting beta-hydroxy-beta-methylglutaryl (HMG)-CoA reductase in the adrenocortical cell. These and other steps in the biosynthetic reaction sequence were described using differential equations subject to the additional constraints imposed by available measurements of intracellular quantities. The resulting model is consistent with many of the known characteristics of the canine adrenal response to ACTH. In this model, steady-state nonlinearities arise from cooperative binding of cAMP to its receptor protein and saturation of mitochondrial pregnenolone transport. The transient response is dominated by a depletable pool of intracellular free cholesterol. Other inferences based on the model are presented, and a quantifiable cellular basis for increased adrenal sensitivity to ACTH is proposed. 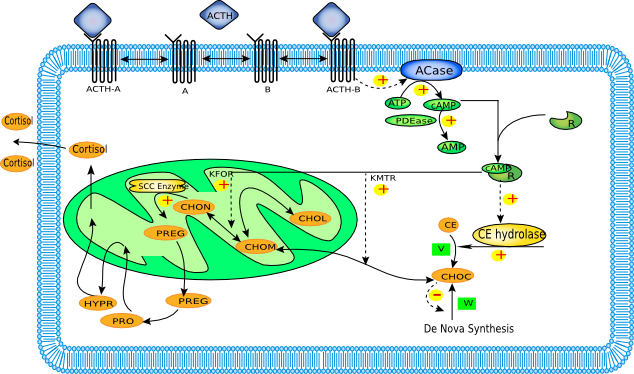 Schematic diagram of the model describing the effects of ACTH on cortisol secretion. (note that ECF represents the extracellular fluid). Derived from workspace Dempsher, Gann, Phair, 1984 at changeset 2ca6eff5a2f3.